Android user? Find your version here! Start right now to enjoy our complete repertoire on the go with your favorite device. 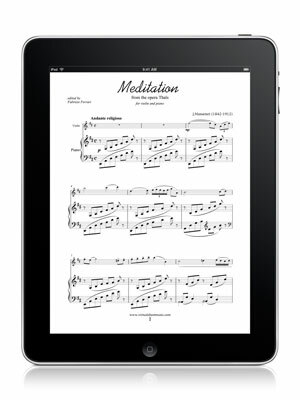 The new free Virtual Sheet Music application for iPad, iPhone or iPod touch (available for free on the App Store) allows you to easily download titles from our catalog onto your device for off-line browsing and instant enjoyment anywhere, anytime. 1. Over 50 high quality free sheet music items included for off-line enjoyment. 2. Browse our online complete catalog of high-quality digital sheet music to download and store titles on your device including PDF, MP3 files and Mp3 accompaniment files to play along with your iPad, iPhone or iPod Touch. 3. 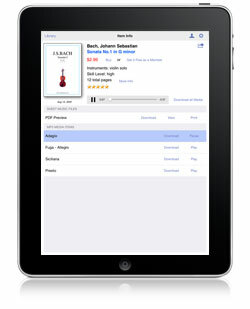 Search the catalog by keyword, organize your music in folders for easy access on the go. 4. Display detailed information about any music item, and listen to Mp3 files (over 40,000 files). 5. Turn pages of downloaded PDF files with just one touch - great for live performances. AirTurn Bluetooth page turner compatible. 6. Send sheet music via email as a PDF file or print it out via AirPrint. 7. Import external PDF files from Safari or via iTunes sharing feature. 8. Members can access their music through the new login feature and synchronize their downloads. 9. Ultra-fast and optimized single-touch page turning system compatible with AirTurn Bluetooth foot pedal devices for a perfect live performance, plus the new Auto Page Turn feature to turn pages without hands. This new feature, available as an optional add-on and with a 24-hour free trial, uses the camera to automatically turn pages by tracking the movement of your head. The application is also available for iPhone and iPod Touch as well as for Android based devices.